By mid-2018, 200 Maldivian foreign terrorist fighters (FTFs) who chose to join the Islamic State in Iraq and Syria had been identified. This is a striking number for a country with a population of only 350,000. In fact, the Maldives is the non-Arab country with the highest per capita number of foreign fighters. Maldivian fighters were also quick to move. In 2015 they already numbered between 50 and 100, which indicates that the Maldivian contingent was one of the first non-Arab legions to answer the Caliphate’s call. In their complexity, the 1,200 atolls that make up the Maldives constitute a textbook case of an ideal radicalization scenario. It features widespread poverty, remarkable crime-terror nexuses, endemic corruption, a severe lack of trust in the state, and foreign cultural and religious influences. 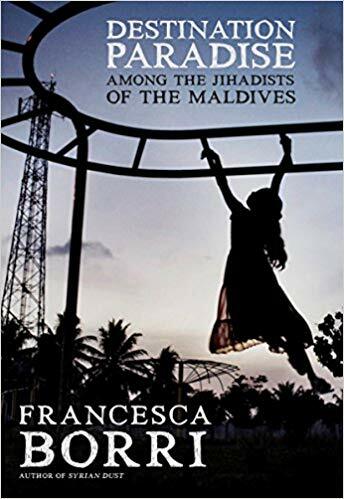 In her book Destination Paradise – Among the Jihadists of the Maldives, the Italian reporter and former human rights adviser Francesca Borri gives us one of the few available accounts of Maldivian radicalization patterns. Her perspective is particularly interesting because she has solid knowledge of the Middle East, where she has been living for around a decade, and finds herself in a very different region. Exploring the Maldives as a European familiar with the Middle East, she is able to find similarities and differences between these three universes. In her work, the author explains that what struck her the most about the Maldives was how normal it is to talk about jihad there “without even lowering one’s voice.” This normality clearly emerges from the book’s pages, which burst with revealing informal encounters and invaluable casual conversations. The Maldives are among the countries that are stereotyped the most – sun, sea, and romantic beaches. As Borri suggests, typically Western tourists do not even notice that this is a Muslim country. The reason for this complete unawareness is the clear separation between the areas occupied by the resorts, which usually claim entire atolls, and the areas inhabited by locals, and in particular Male, the capital city, where Maldivians have to go for the majority of their needs. Given the small population and the revenues from the flourishing tourist sector, the financial situation could be good enough to improve the living conditions of all Maldivians. In the words of one of the people the author meets, “the Maldives could be like Dubai, like Switzerland. The population is small, and tourism generates billions of dollars.” But this person adds: “Yet everything here is a favor, a concession. If you get sick, you knock on the President’s door and they pay for your treatment in Sri Lanka, which is why no one rebels. We are not citizens, we are mendicants”. In fact, the money generated from tourism ends up in the hands of local and international entrepreneurs in a country where 5 percent of the population possesses 95 percent of the wealth. Life is tough for ordinary people – an average salary is 8,000 rufiyaa, or around 500 euros, while renting three rooms costs around 20,000 rufiyaa. Throughout the first part of her book, Borri effectively describes the role that gangs play in Male’s urban fabric. The city is split up among approximately thirty gangs and each gang has between fifty and five hundred affiliates. This means that gangs take in around one-fifth of the youth, who make up the majority of the population, since the average age in the archipelago is just 18.7 years. As for the police in Male, they are perceived as one of the many gangs from which one must protect oneself. Once a young man joins a gang, the radicalization patterns are strikingly similar to those seen in many other countries. He may begin taking drugs as a kid, at around twelve years old, and then move from being an occasional delinquent to an habitual offender. Typically, he faces prison terms for common crimes and then one or more members of his group radicalizes behind bars, which makes for peer pressure. Alternatively, a recruiter approaches him, giving him a Qur’an and talking about Syria and the oppression Muslims are suffering worldwide. In fact, Francesca Borri highlights that the recruiting centers are mainly prisons, not mosques. In addressing prison radicalization, however, the author does not overlook other social issues and factors that can contribute to creating a breeding ground for radicalization. Once again, some processes that the author describes will resonate with people who are familiar with Middle East history. After studying in the Gulf, Pakistan, or Egypt in the 1970s, many young people began returning to the Maldives with more conservative religious views. Male does have a university, but even today the best option is to study abroad, and in order to do so many families need some form of financial support, which is not provided by the state. Thus, the only option is to turn to religious institutions and mosques that are supported by much richer countries, which are particularly willing to help those who want to study religious subjects. In this respect, the story of the Maldives is the story of many other countries. Islamists gain influence through involvement in education and their ability to fill vacuums left by a state providing poor services to its citizens. Another familiar tactic is presenting themselves as freedom and justice supporters challenging oppression rather than secularism. Furthermore, they were violently repressed by Maumoon Abdul Gayoom, the President between 1978 and 2008, and this granted them an even greater aura of martyrdom. 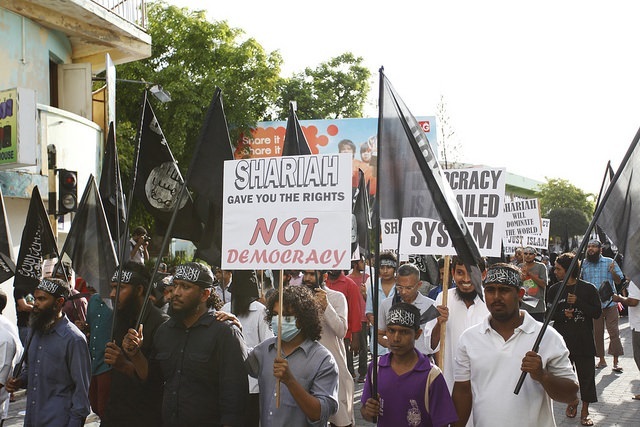 Nowadays, the widespread perception among secular activists from the Maldives is that religion’s presence in the public sphere has increased significantly. It is forbidden to own a Bible or a Torah. The main subject in school is practicing Islam. Only Muslims can obtain Maldivian citizenship. The constitution recognizes freedom of opinion, but only if it is not exercised in a way contrary to Islam. The path to jihad is open in this context. As noted earlier, young radicals began to leave the country to go to Syria in recent years, but the government denies categorically that there have been Maldivians involved in that conflict. According to official statements, radicalization does not exist in the country. Based on the accounts collected by author of Destination Paradise, it is quite clear that nobody checks you or stops you when you are about to go to Syria. Authorities have every reason to get rid of these youths, and they want to go. One says: “We all want to leave. Anything is better than Male. In Syria, if nothing else, I would be killed for a worthier reason”. Therefore, for many people in the country, Syria is both an economic and a moral opportunity. In the second part of the book, Borri describes her meeting with three Arab recruiters and traffickers. They are logistics specialists dealing with people and weapons, neither for al-Qaeda nor for the Islamic State, or maybe for both, and the author knows war well enough to understand that ultimately it does not make a big difference. The most interesting part of the author’s journey is probably her stay on Himandhoo, the most conservative island. Himandhoo is the bastion of radical Islam and many of its inhabitants left for Syria and Iraq and, before that, for Afghanistan. The island is connected to the first and so far only terrorist attack in Maldives history, which took place on July 29, 2007 in Male. A bomb in a park injured 12 foreign tourists. On August 10, the police landed on Himandhoo to look for the perpetrators, but they were confronted by dozens of armed men and were forced to flee. On the island, there are many Islamic volunteer organizations that operate under no control whatsoever and there are rumors about jihadi training camps on islands far from Male. Overall, the only discordant note in a passionate yet balanced work is the author’s simplistic stance concerning the European view of Muslims: “Here, we have to explain the jihadists while keeping close to the walls. On the other hand, even in Europe it’s the same thing, given that Muslims, all Muslims without distinction, are now the blacks, the Jews of this century, who apparently don’t have a single quality, not one decent, positive thing to teach, nothing: they apparently are a problem, period, in this Europe in which if you try to explain the jihadists, you too are a terrorist (…) Where you are forbidden to even write the words Islamic State because to do so, they tell you, would mean acknowledging it and legitimizing it. Besides the quite obscure nature of the phrase “explaining jihadists”, the narrative that all of Europe is racist and Islamophobic is obviously misleading and does not add much to this otherwise informative volume.